Family room design ties together family entertainment, comfort, and style. Often called a "great room," the ideal family room is a place for all members of the family to relax, watch a movie, read a book, and just enjoy some time together. 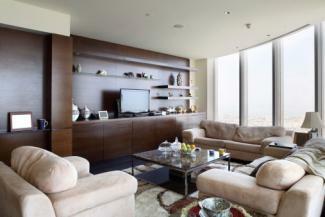 Such rooms are generally less formal than traditional living rooms. The best place to start your family room design is to decide what function the room is going to serve in the home. 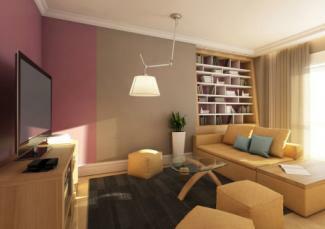 Family rooms can serve as the entertainment room of the house. This is where the family watches television and movies, listens to music, and plays video games. This type of room should have a media center with all the different entertainment systems such as the television, DVD player, and the video game console. The media center can be enclosed or left open to the room. A family room used for entertainment should also have comfortable seating situated around the media center. A family room could also serve as the main social room in the home. 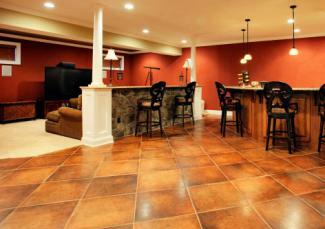 This is where any parties or small gatherings are held. You should decorate it to impress guests. If a media center is present, enclose it behind doors. There needs to be plenty of seating in the room focused on facing other people rather than a television. Some families with smaller children choose to use the family room as a playroom. All the toys may be stored in this room as well as a television and DVD player. Even though a family room may serve the purpose of a playroom, keep it clean with the toys in a neat area stored in a corner of the room. The family room can easily be the getaway room where the family goes to relax. It could be where families gather to spend time together and talk. It could be where mom relaxes with a book after a hard day or where dad reads the Sunday paper every week. For this type of family, comfort is the key element. There should be comfortable seating as well as a relaxing and inviting atmosphere. Some people may find that their family room does not fit into just one of the categories above. They may use it as an entertainment room as well as a sitting room. If a family room serves more than one function, arrange it so it best fits the needs of the family. There are several styles to work with in the family room. While many of these designs will flow from the rest of the home, sometimes a blend can be achieved of a slightly different family room from the rest of the home to help emphasize its casual nature. A classic style has a warm and intimate feeling. It doesn't having anything too flashy or bold. The decor never goes out of style and pieces are simple and ageless. A contemporary style has clean lines with minimal furnishings. This style is no longer only black and white, but it has incorporated monochromatic decors of brown, tan, gray, and blue. A country family room could have an all-American style or could be a French country theme. The American country style is popular with family rooms as it is more casual. An eclectic style has a mixture of different styles that somehow all work together to form a coherent appearance for the room. Not everyone can pull off eclectic rooms because they tend to look over-cluttered and sloppy. The Tuscan style takes the Old World charm and brings it into the home. Yellows, reds and oranges are abundant in Tuscan style while furniture pieces should be rustic and primitive. Rich velvets and deep colors like burgundy and emerald green characterize Victorian rooms. Accents of lace, tassels and fringe complete the Victorian look. A successfully decorated family room needs to incorporate ample seating, entertainment options and unobtrusive storage. Seating - A family room needs seating for the family to enjoy the room's entertainment options and in which to relax. Ideally, the furniture in a family room should be soft and comfortable with separate areas for TV viewing, game playing and office work (if applicable). Entertainment - The family room is the place for that big-screen TV, the Nintendo game console, and the mega-watt stereo system. Guard against designing the entire room around one item, like a flat-screen TV, however. A perfect family room is about enjoying family and friends, not a showcase for a new electronic "toy." Storage - In addition to comfortable seating and entertainment options, a family room needs a tasteful and organized place to store books, CDs, DVDs, games and other entertainment accessories. Built-in bookcases are one option as are entertainment centers with drawer and racks for storage. Soft Flooring - Add a soft rug or several scattered throw rugs underfoot to add to the sense of comfort in the room. Color - A family room is not the place to try out that bold, "in-your-face" color palette. An ideal family room design is soothing and peaceful, using cool and neutral colors, reserving bright colors for accents. Lighting - Lighting in a family room needs to be bright for games and reading as well as low and offset for TV viewing and relaxing. Lights with dimmers are one way to do this, or you can have different types of lighting for each activity. Traffic Pattern - A well-designed family room should have a comfortable flow from one area to another. When you enter the room, it should be easy to get to the different seating areas without walking around furniture or squeezing through a tight area. Seating areas may be defined by rugs, by furniture groupings, and/or by color. Controls - Another important thing to consider is how you can conveniently control the lights, the television and other entertainment options. Consider placing the light controls and the master console near the main seating area so that you won't have to get up and down constantly when you are enjoying the room. Comfortable Seating - A sectional sofa big enough for the whole family to sit together, an ottoman that can double as a table and multiple sitting areas to enable multiple discussions can all lend themselves to a comfortable space. 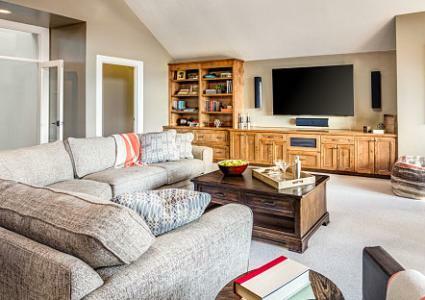 Answering these questions will help you determine how much space you need for your family room, how much seating to provide and what your priorities are when it comes to budgeting. How will you use the room? Will you be watching television or hosting parties? Will it be a place for doing homework or listening to music? How many people do you need to seat? Do you want one main seating area or several smaller seating arrangements? Do you want to be able to rearrange furniture when you are entertaining? If the answer is yes, then don't buy a sectional sofa. Will you eat meals in the room or will food be off limit? If you will serve food in your family room consider stain resistant fabrics for the furniture and carpeting. Will you have a computer in the room? If so, do you need to plan for cord management or will you set up a wireless router in your home? How long do you need your furniture to last? Do you have plans for another redo in a few years or do you need to live with this furniture for many years to come? Do you have pets or small children? Do you need to safety proof the room? What are your storage requirements? Will the room house toys, books, games or CDS? Since today's family rooms are often the most used rooms in the home, make sure to integrate the room's design with the rest of the house. You can accomplish this by choosing a color scheme that flows with the rest of the house. Also, be sure to match architectural elements like molding and flooring with the other rooms. Remember that the most important part of your family room design, is making it a comfortable place for family and friends to gather and relax.